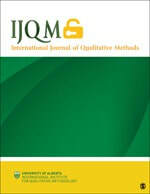 Dr. Srivastava's article (with Nick Hopwood), 'A Practical Iterative Framework for Qualitative Data Analysis', first published in 2009, was selected for inclusion in the International Journal of Qualitative Methods Special Issue, 'Top 20 in 20'. The special issue celebrates the journal's twentieth anniversary. Articles were chosen on number of downloads and citations. Read the commemorative reflection here. Dr. Srivastava was interviewed by the Chronicle of Philanthropy for the story, 'Gates Jumps into International Education with $68 million for Data-Based Solutions' (1 Jun 2018). The story is on the Bill & Melinda Gates Foundation's announcement that it will devote $68 million over four years in India and two countries to be decided in Sub-Saharan Africa. Non-State Actors in Education in the Global South. Edited by Prachi SRIVASTAVA & Geoffrey WALFORD, Routledge Special Issues as Books Series, London, Routledge, 2018. Fueled by social equity concerns, there have been vigorous debates on the appropriateness of certain non-state actors, particularly those with commercial and entrepreneurial motives, to meet universal education goals. There are further questions on the relative effectiveness of government and private schooling in delivering good learning outcomes for all. Within this debate, several empirical questions abound. The chapters in this volume present new empirical evidence and conduct critical analysis on some of these questions. This book was originally published as a special issue of the Oxford Review of Education and selected for publication in the Routledge Special Issues as Books Series. Dr. Srivastava was invited to present global research evidence on low-fee private schooling to the Japan International Cooperation Agency (JICA) in Tokyo, in October 2017. The World Bank's 2018 World Development Report on Education: a sceptic's review. Prachi SRIVASTAVA, From Poverty to Power, Oxfam Blog, 18 October 2017. Dr. Srivastava was invited to review the World Bank's 2018 World Development Report in the Oxfam From Poverty to Power blog. She discusses the report's contributions as: making a strong moral case for prioritizing education and learning; highlighting the learning crisis; demonstrating the link between neuroscience and education; and presenting relatively balanced (though condensed) evidence on private sector provision and private schooling. She argued that the case for financing education should have been less ambiguous, and for a stronger focus on learning processes within schools and classrooms and their potential effects on learning. Are Low-cost Private Schools Helping Achieve Quality Education for All in Africa?, Smackdown Debate, Africa Knowledge Fest 2017, World Bank, Washington, DC, 22 February 2017. ​Dr. Srivastava was invited to debate the issue of low-fee/low-cost schools as part of the World Bank's Africa Knowledge Fest at Headquarters in Washington, DC. She argued about the need to question proportional household income devoted by parents to access these schools and the inconclusive evidence on quality. Fellow debaters included, Katie Malouf Bous (Oxfam), Reshma Patel (Impact Network), and Irene Pritzker (IDP Foundation). Non-state Private Actors in Education in the Global South (special issue). Edited by Prachi SRIVASTAVA & Geoffrey WALFORD, Oxford Review of Education, 42(5), 2016. ​This Special Issue is concerned with the growth of non-government schooling in the Global South where a great variety of non-state private providers have become increasingly active. A vigorous debate has emerged on the appropriateness of certain non-state actors, particularly those with commercial and entrepreneurial motives, to meet universal education goals, as well as on the relative effectiveness of private schooling and its ability to mitigate against social inequities. A number of empirical questions abound, such as relative student achievement and learning outcomes; relative costs; impacts on households accessing fee-paying sectors; the nature of the market at various education levels; relationships between different types of non-state actors and between them and the state; and regulatory compulsions. There is also a need to sharpen conceptualisations on the types of non-state actors operating in the Global South, and the nature of their engagement. This Special Issue brings together eight original contributions addressing some of these questions. ​The Myth of Free and Barrier-free Access: India's Right to Education Act--private schooling costs and household experiences. Prachi SRIVASTAVA & Claire NORONHA, Oxford Review of Education, 42(5), 561-578, 2016. We examine relative household costs and experiences of accessing private and government schooling under India's Right of Children to Free and Compulsory Education Act, 2009 in the early implementation phase. The Act deems that no child should incur any fee, charges, or expenses in accessing schooling. Private schools are mandated to allocate 25% of their seats for free via 'freeships' for socially and economically disadvantaged children. Furthermore, the Act has a number of provisions attempting to ease barriers to admission and entry to all schools, including private schools. This paper reports household-level data on the schooling patterns, experiences, and perceptions in ones Delhi slum accessing schooling based on a survey of 290 households and 40 semi-structured interviews. We found very low instances of children with private school freeships. Furthermore, children in 'free' private school seats incurred the second highest costs of accessing schooling after full-fee-paying students in relatively high-fee private schools. Finally, households accessing freeships and higher-fee schools experienced considerable barriers to securing a seat and admission. New Global Philanthropy and the Second Wave of the Low-fee Private Sector. The Global Education Industry: Philanthropy, business, and the changing role of government. 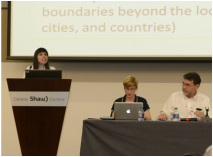 Roundtable, World Social Forum, Montreal, 10 August 2016. Dr. Srivastava was invited to address a roundtable at the World Social Forum on the implications of the expansion of non-state actors on education governance in the Global South, in particular the expansion of low-fee private school chains and ancillary education service providers backed by philanthropic arms of corporate and business sectors. Fellow panellists were Antonio Olmedo and Curtis Reip. “The number one question policy-makers need to ask themselves is: ‘low-fee for whom?'" Private or Public: Does the proliferation of low-fee/low-cost private schools improve or impede learning for all? Debate for UNESCO IIEP Learning Portal, August 2016. Read the transcript and listen to the interview here. ​Dr. Srivastava was interviewed by the International Institute for Educational Planning (IIEP) to provide expertise and research-based assessment on the impacts that low-fee private schooling have on education for all. 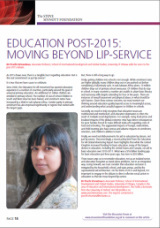 Prachi SRIVASTAVA & Lianna BAUR, in The Handbook of Global Education Policy, edited by K. Mundy, A. Green, B. Lingard, & A. Verger, Wiley-Blackwell, West Sussex, UK, 2016. ISBN 978-1-118-46805-0. ​The tail-end of EFA, the post-2015 discourse, the disenchantment with ODA, and the growing presence of an increased array of international and domestic private non-state actors constitute a new moment of the politics of education. Alongside the funding and learning crises framing post-2015 engagement in education, there is a growing buzz around the potential of philanthropic actors to fill resource gaps and substantive gaps in scaling up ‘solutions’. This chapter reports results of a systematic-type literature review on philanthropic and private foundation engagement in education in developing countries. Results are extended by a discourse analysis of strategy documents of some of the most immediate post-2015 international fora and strategies impacting education, and comparing these with previous frameworks to locate the articulated roles of the private sector and philanthropic actors. Results of the review found a tendency of the logics of intervention of philanthropic engagement to be market-oriented, results-oriented and metrics-based, and top-down, and for the post-2015 architecture for philanthropic engagement in education to be framed by blurring corporate, philanthropic, and domestic and international development activities and actors, operating in new formal and non-formal global policy spaces. The chapter sketches the beginnings of a conceptual analytic on ‘new global philanthropy’ and philanthropic governance in the new moment of the politics of education intimated above. Prachi SRIVASTAVA, in The Global Education Industry—World yearbook of education, edited by A. Verger, C. Lubienski, & G. Steinder-Khamsi, Routledge, New York, 2016. ISBN 978-1-138-85539-7. This chapter argues that we are entering a ‘second-wave’ in our understandings and analyses of the low-fee private sector; as is the sector, of its evolution. What first seemed like small, disconnected, individual schools ‘mushrooming’ in specific contexts where there was little or poor quality state provision, has taken root as a phenomenon, purportedly of scale, backed by corporate actors, particularly in some parts of Sub-Saharan Africa and Asia. I argue that the second wave sees a shift from ‘one-off mom-and-pop teaching shops’ in schooling micro-ecosystems (individual villages, slum communities, and urban neighbourhoods), to their coexistence with corporate-backed school chains and allied service providers. These chains operate as part of a micro-system within themselves, sometimes across geographical boundaries beyond the local (across districts, cities, regions, and countries). The entry of ‘big’ corporate capital, both domestic and international, and the emergence of an ecosystem of allied service providers for this sector (education micro-finance institutions; rating systems; scripted curriculum delivery systems; education technology providers (low- and high-tech, etc. )), many of which are also corporate-backed or run, are markers of institutional evolution (DiMaggio & Powell 1983). Prachi SRIVASTAVA, Contemporary Education Dialogue,13(1), 5-32, 2016. 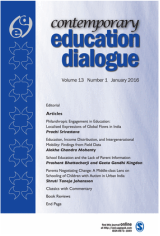 This article argues that the rise of domestic and international philanthropic engagement in education in India cannot be understood in isolation; rather, it is part of a broader trend of what is termed ‘new global philanthropy in education’ in the Global South. Central to understanding the nature of this engagement is the localised expression of global flows, that is, the movement and connections of ideas and actors that enable philanthropic action and discourse. Based on a global review of the literature, this article contextualises and applies a conceptual framework of philanthropic governance to India given the country’s prominence in the review. It also presents illustrative examples of philanthropic engagement in India. Dr. Srivastava was invited to present evidence on low-fee private schooling to the new session of the UK Parliament's All Party Parliamentary Group on Global Education for All in Westminster. Her presentation was titled, 'Does the UK Government Believe in Evidence-based Policy? A Review of Evidence on Low-fee Private Schooling'.Fellow speakers were Salima Namusobya (Executive Director, Initiative for Social and Economic Rights-Uganda), Moses Oktech (Professor, UCL Institute for Education), and Catherine Pinder (ARK Schools). The session was chaired by The Rt Hon Chris Heaton-Harris, MP for Daventry. Dr. Srivastava was invited by the European Commission Directorate-General for International Cooperation and Development (EC DEVCO) to speak on the issue of private sector engagement in basic education in developing countries in Brussels in October 2015. The session on private sector engagement was part of EC DEVCO's Annual week-long seminar on education and TVET. Prachi SRIVASTAVA, NORRAG News, August 2015, pp. 104-106. There is growing buzz about the potential of philanthropic actors to meet gaps in financing and to implement learning ‘solutions’ in the Global South. However, there are substantive gaps in data tracking philanthropic engagement, and in funding that global education attracts from international philanthropic organisations. Turning our attention to philanthropic engagement by Southern actors in the South may provide more clarity; however, knowledge gaps remain. Dr. Srivastava was recently commissioned by the European Union to write a report on private sector engagement in basic education in developing countries. The report has been submitted. Further discussion is underway to make the report publicly available. Dr. Srivastava was invited by the Center for Universal Education, Brookings Institution to review the evidence on low-fee private schooling and debate the role of non-state private actors in global education, as part of the annual CUE Research Symposium on 5-6 March 2015. Fellow panellists included, Shanta Devarajan (World Bank), Angelo Gavrielatos (Education International), and James Tooley (Newcastle University; Omega Schools; Beautiful Tree Trust). Dr. Srivastava was invited as a speaker to the 2014 WISE Summit, Doha, Qatar on global education to discuss the evidence on and debate the role of low-fee private schooling in developing countries. Fellow panellists included, David Archer (ActionAid), Mwangi Kimenyi (Brookings Institution), Reshma Patel (Impact Network), and Meeta Sengupta (Center for Education Strategy). View debate highlights here. Dr. Srivastava was asked to present an invited lecture for the Yale University Jackson Institute for Global Affairs on the appropriateness of non-state private actors in early childhood education provision in developing countries for students working on a Capstone Project for UNICEF. The logic of ‘scarce resources’ has been used to mobilise increased action by private non-state actors in education in parallel (perhaps, seemingly paradoxically) with a concerted programme for universal elementary education, Sarva Shiksha Abhiyan (SSA) from 2000, and the newly legislated Right of Children to Free and Compulsory Education, 2009 (RTE Act). Concerns for political expedience led to under-financing of the RTE Act in favour of increased private sector engagement, presumed to meet additional capacity. Increased private non-state engagement was encouraged by macro-planning processes and frameworks that were enthusiastic about such involvement, particularly through public-private partnerships (PPPs). This has led to the emergence and increased engagement of ‘new/non-traditional’ private non-state actors in education. There may be ensuing tensions regarding the roles that the private non-state sector can play in view of the legal compulsions of the RTE Act. Prachi SRIVASTAVA & Claire NORONHA, Economic and Political Weekly, 49(18), 51-58. While some of the controversies on India's Right of Children to Free and Compulsory Education Act, 2009 (RTE Act) were reported in the media and publicly discussed, this paper exposes contestation, controversy, and concessions that were made in policy backrooms throughout the processes framing the Act. The paper presents results from a larger household, school, and institutional-level study on the role of the private sector and the early phase of implementation of the RTE Act . We report data from semi-structured interviews with key education officials and implementers, some of whom were responsible for drafting the Act, and trace successive iterations of draft bills. We found financial concessions, concessions on quality, and concessions on pre-school as an unfulfilled right. We also trace the evolution of the 25% free seats provision and outline the related internal controversy. The broader debate surrounding India's Right to Education Act raises questions about the role that the private sector could and should play in expanding access to basic education for the most disadvantaged, and whether, the 25% free seats provision in particular, is emblematic of further privatization. This chapter presents analysis of data on how private schools accessed by households in a Delhi slum responded to the Act in the early phase of implementation. We found considerable policy-practice gaps regarding the implementation of the Act and the free seats provision by schools in our study. This was not helped by unclear procedures set by the government for private schools regarding implementation and reimbursement. 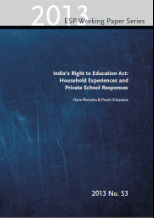 This study aimed to shed light on the early phase of implementation of India’s landmark Right of Children to Free and Compulsory Education Act, 2009 (RTE Act), effective as of April 2010, with special attention on the role of the private sector (i.e. private unaided schools). This working paper reports on the household- and school-level results of a larger project conducted in a Delhi slum. We report results on the implementation and mediation processes in schools; experiences of households accessing schooling under the RTE Act, with a focus on their ability to access free school places under the 25 percent free seats provision; and household and school understandings of the Act and its provisions. Results indicate a considerable gap between the official articulation of the Act’s provisions and its implementation in practice by schools in the study. Data also expose that fee-free 'freeship' private education for households in the study, was not a reality for these households. View article as blog post here OR Download full magazine issue here. This article argues while there is some cause to celebrate in education, the post-2015 discourse must address three important issues. These are: meaningful access for all; the multifaceted and interlocked nature of education deprivation and its relationship to social deprivations; and holding donors accountable to sustained financing for education in face of falling international aid. The special issue of ENGAGE includes contributions from Sir Bob Geldof, Carol Bellamy (Chair, Global Partnership for Education), and Madhav Chavan (Founder, Pratham) among others. This study, commissioned by the UK's Department for International Development (DFID), reviews the evolution of the private sector over the first 10 years of the Government of India's Education for All programme, Sarva Shiksha Abhiyan. The terms of reference set the focus on public-private partnerships (PPPs) and private schooling, with an emphasis on low-fee private schooling. The study found that there was growth in private schooling (including low-fee private schooling), and a number of PPP initiatives operated in education during the decade of universalising elementary education. These phenomena occurred within a parallel macro-planning process that was generally supportive of the private sector and PPPs. This was despite the fact that SSA vision documents did not explicitly articulate a role for the private sector in expanding access, particularly regarding the schooling of disadvantaged groups. Low-fee Private Schooling: aggravating equity or mitigating disadvantage? Low-fee private schooling represents a point of heated debate in the international policy context of Education for All and the Millennium Development Goals. While on the one hand there is an increased push for free and universal access with assumed State responsibility, reports on the mushrooming of private schools targeting socially and economically disadvantaged groups in a range of developing countries, particularly across Africa and Asia, have emerged over the last decade. Low-fee private schooling has, thus, become a provocative and illuminating area of research and policy interest on the impacts of privatisation and its different forms in developing countries. This edited volume aims to add to the growing literature on low-fee private schooling by presenting seven studies in five countries (Ghana, India, Kenya, Nigeria and Pakistan), and is bookended by chapters analysing some of the evidence and debates on the topic thus far. A research report outlining the key issues associated with how the role of the private sector in education has evolved over the last ten years of Sarva Shiksha Abhiyan (SSA), the Government of India’s flagship programme for universal elementary education, was submitted to the UK's Department of International Development in India. Click here for more information on the project. The Open Society Institute's PERI-funded project, 'Privatisation and Education for Disadvantaged Groups in India: institutional responses, conceptualisations, and access', was completed. Results have been presented in a full report on the institutional framework of the Right to Education Act and how private schools are situated therein; how the Act directed local policy action; the way it was mediated/implemented by local schools; and the experiences of disadvantaged households accessing schooling in the context of the RTE Act. A working paper on household experiences and school responses is in press, and a number of publications on the results are planned. Click here for more information on the project. Dr. Srivastava was awarded a major Insight Grant (value approximately $300K) as Principal Investigator by the Social Sciences and Humanities Research Council of Canada (SSHRC) for a multi-year project to study the changing role of private non-state actors and the right to education, taking India as a case. The grant is one of the largest in the Faculty for that funding round. Click here for more information on the project. Featured alumna by the Oxford Education Society. These featured alumni profiles are useful for graduate students to get a glimpse of the winding road that careers in education can take. Read profile here. Dr. Srivastava was interviewed for an article on education development and philanthropy for the Stanford Social Innovation Review. See below, 'Economic Influence'.